तूफान छुपे हज़ारों अंदर,बाहर शांत हूँ...! अपनी जान मैं दूसरे पलड़े में रखती हूँ...! शान नवाबों सी ,मुफलिसी में भी मैं आम रखती हूँ...! उसूलों का तेरे मैं मान रखती हूँ, ऐ जिंदगी...!!! 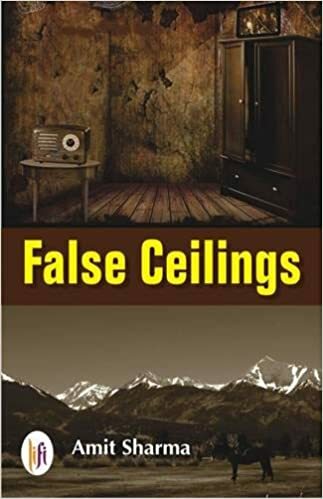 ​‘False Ceilings’ is an engaging and complex family saga story vides spread about generations and generations thereafter. It is the story of Shakuntala, a young girl, who has a surreal life despite of some harsh conditions in the beautiful town of pre-Independence Dalhousie when life changes completely because of the twist and turn of events. The story takes you on a wind whirl journey from beginning to end of her life and times, her children, grandchildren and beyond. The story explores India before the era of 1920s and spans to a period in the future till 2050. The tale moves ahead as India undergoes her own period of churning and progression. Indeed everybody will be able to find a part of them in the story, especially the who have a inclination towards history of India. The story has certain incidents which are or were once a part of everybody's life. The silly tiffs which curved into larger issues in family. The struggles and the lack of equation between the mother-in-law and daughter-in-law in turn poisoning the lives of many others on daily basis. The sensitive’ Aaryan’, who gets emotionally scarred from childhood. The enthusiasm of ‘Lipi’. The fate of Kanshi Ram, the suffering of ‘Kusum’, the terror of ‘Radha Devi’, the lack of confidence in ‘Vinod’ who is pulled between a wife and mother, the inefficacy of ‘Manohar’ and not to forget weakening of Shakuntala’s character.The story flows simply and the writing seems to come naturally to the author. The climax was quite interesting with twists and turns as they unfold. For that you need to read this book. The positives of the story are the primitiveness in the narration that impressed me. The author narrated the story in a very unique way; it seemed as if he is talking to the readers personally. The author has been successful enough to connect with the readers, I loved it, and I am sure that the target audience will love this book too. Overall if asked I would say this is a good book, perfect accompaniment to your weekend pastime. 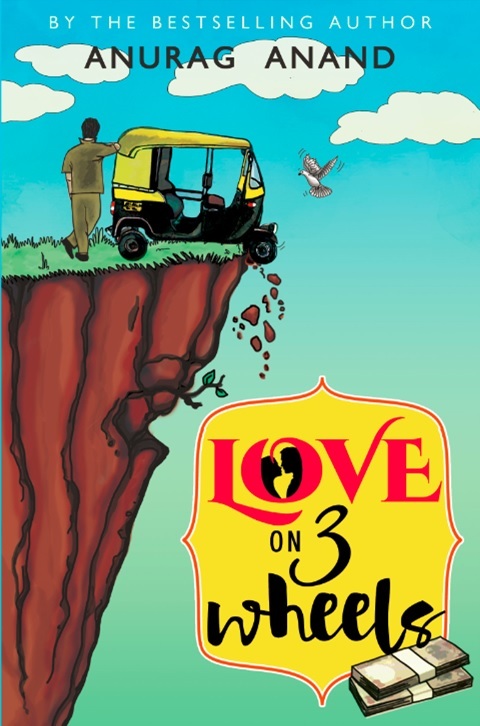 Overall I would say...this is a good job done by Author (Amit Sharma) … I would give 3 stars to this book. Getting Things Done (also known as the GTD system) is a task management methodology. 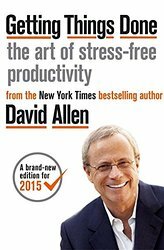 Before anyone of you dismiss this book as boring hear this: GTD changed my life about seven years ago when I read David Allen’s book and implemented his system. If you are a geeky isolated person like me and want to have more time to do the things you enjoy–and be able to enjoy them even more because you know you aren’t dropping the ball somewhere else–then indeed this book is meant for you. Let me draw some light about what the GTD system is and what it could potentially do for you. After all, you aren’t visiting GeekDad to brush up on your task management skills; you are here because you share our passion for all things. Being a nerd is all about being able to spend time over things that truly matters to you. You can only manage to spend time doing this once your professional and personal commitments are met, and it is always easier said than done. “Mind like water” is a phrase that David Allen uses often in this book. It means being able to have nothing on your mind except the present. It doesn’t mean you aren’t extremely busy, but it does mean that you no longer stressing out about “that thing. Don’t stress over the tools and how to get started, just read the book and follow David Allen’s instructions, and in no time you too can be focusing on really important things. In order to know the tricks and bring them into practice grab a copy and unfold the magic. The entire book is about positivity and positive attitude towards life. Although the description of the book is wonderful but at some places it becomes stagnant. If the author has added up some life examples, it would have increased the interest of reader to great extend. Overall if asked I would say this is a great book in order to change the positive attitude towards life. I would give it 4 stars. I am like any regular 38 year old MNC executive in Mumbai. Weekdays are about sometimes surviving till the weekend. Life is like a post-paid sim card where you know you are burning far more than your capacity and someday, somewhere you will have to pay a heavy price for it. Yet, for some unforeseen reason you play along. Weekend is about somehow finishing all the piled up tasks to manage a few hours of solitude and downtime and life now becomes like a prepaid sim card which you try to consume with as much efficiency and balance as you know you have only that much capacity to give. When I was young, I always thought adult life would be more around thinking hard during weekdays and not thinking at all during weekends. That’s how school life is. Strange, how real life is complete opposite of what it comes across in dreams. People sometimes compliment me for my creativity. I, however, think that I am a philosopher hidden inside a stand up comedian. 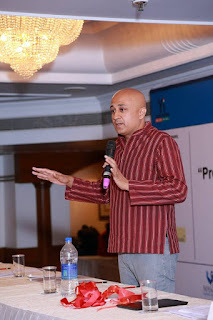 I first got involved in writing during my MBA days in Mumbai. A friend of mine was involved with a music channel and they needed scripts for a show. I cracked a few jokes at the audition and was selected. Helped me make good pocket money. After college, I left Mumbai and also this hobby. Then five years ago I came back to India and somehow became old, bored and thick-skinned enough to look inside me on what would interest me now. That’s when I decided to plunge into writing again. My biggest challenge is to write something that I am proud of. Nowadays it is also becoming about meeting expectations of the people. By the grace of God, ‘Child/God’ has garnered loads of appreciation. The flipside is that now people just won’t compare me with Chetan Bhagat but also my own past work. 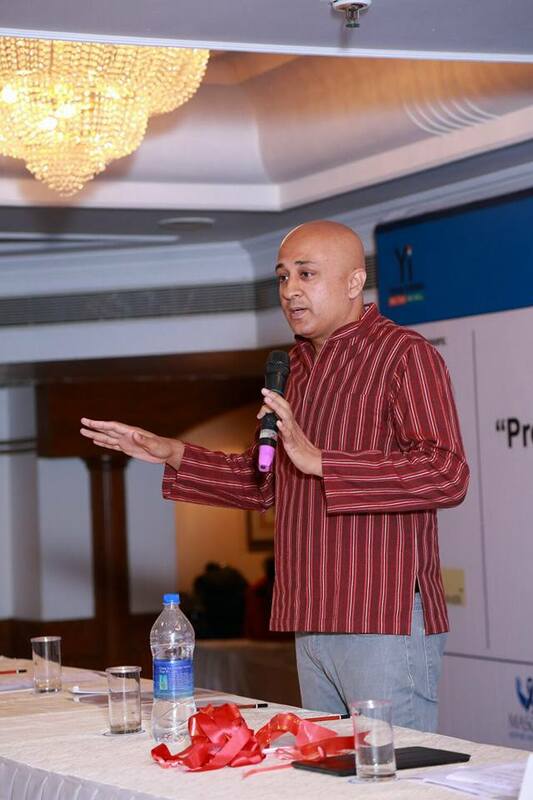 A regular MNC job and motivational lectures keep my schedule fairly busy. I am also a serious student of the Holy Geeta. Bulk of my non-writing time goes in these three pursuits. Five years ago, my life was totally different from what it is today. Five years prior to that, my life was totally different from what it was five years ago and what it is now. That’s the fun and that’s the scary thing about life. Though my stories are fictional, they are inspired from real life people and events. The philosophy is also inspired from the Holy Geeta. Nobody in life can plan to become big in anything. You can only aspire and work towards it. I meet successful people from many fields – entrepreneurs, writers, actors, singers, speakers, teachers, students, corporate executives, etc. – and till date I haven’t met anyone who knew how much successful and how much failure awaits us. Try as much as we might, life has a way of overwhelming us. So do not write to become a celebrity. That is incidental. Write only when you have such a strong urge within that you have no choice but to write to be normal. A fresh perspective. A writer and a reader have a strange relationship. They are complete strangers who usually never even speak to each other. Yet, a writer through his story can penetrate into the soul of a reader, an area where sometimes even the closest loved ones are not allowed. The majority of the readers tend to take sides due religion and such other considerations. Nope. The best thing about novels is that there is no censor board. Unless you are a celebrity writer like Salman Rushdie or Chetan Bhagat, you can get away with writing anything on anything. ‘Child/God’ is a choice of perspective. A newborn baby can be viewed either a tiny, helpless, ignorant infant or as a manifestation of the almighty wise God. The 35 year old protagonist of my story views his 3 month old child as his guru and so refrains from teaching him anything. Rather he tries to learn the meaning of life from the child. His wife, on the other hand, views the same child as someone who needs to be taught the ways of the world. It’s just a reflection of today’s mindset where results matter more than the means. Denial of someone’s right isn’t an issue anymore. Not being able to sell is an issue. So much that the one who sells is the star. Not the one who creates! We live in times where the villains of the movie, for example Batman series in Hollywood and Dhoom series in Bollywood, are much more glamorous, cool and suave than the heroes. We live in times where we do not know the names of JNU toppers but definitely know the president of their student union who has gone to jail. We live in times where the biggest salesman of the anti-corruption movement is now a chief minister and much more popular than the actual creator of the movement. Plagiarism is just the tip of the iceberg! The mindset of decoupling ‘means’ to ‘ends’ is going to produce a lot more innovative crimes in times to come.